» *Connection under residual pressure is allowed in both sides, the internal valve system allows an easy connection and the disconnection is included. » Flat face is easy to clean, reducing the inclusion of contamination to the hydraulic circuit. » Minimal fluid loss during disconnection, reducing fluid loss to the environment. » Minimal air inclusion during connection / disconnection. » Patented internal valve design creates minimal pressure drop, maintaining circuit efficiency in the system. 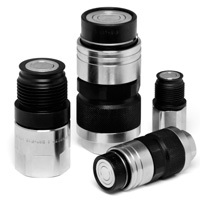 » Internal pressure release valve system allows an easy connection with high internal residual pressure. » The safety sleeve integrated in the connection system prevents the accidental disconnection. » The modular design allows flexibility with a wide range of configurations. » High resistance at impulse pressures. » Safe and simple to use.